The Surgery Department's eight-week Clerkship can accommodate a maximum of seven students per rotation. Each student participating in the surgery clerkship will become familiar with a variety of surgical diseases and their diagnosis in order to recognize the need for surgical consultation. Students will learn how to prepare patients for surgery, both medically and psychologically. Students will also learn how to manage patients postoperatively, in the ICU, the hospital ward and as outpatients. Students are assigned to General Surgery, Trauma, Critical Care, Pediatric Surgery, Vascular Surgery, Transplant Surgery, Colon and Rectal Surgery, or Surgical Oncology. Students are assigned to a three week rotation on the general or trauma surgery service, three week rotation on colon and rectal surgery or surgical oncology services, and an elective week rotation on the vascular, transplant, or surgical critical care services. For specific service requests, please contactÂ Rachel Roberts. Rotation requests are first-come-first-serve and should be made at least 30 days prior to the clerkship start. The surgical subspecialties of orthopedics, ENT, ophthalmology, and urology are offered in Knoxville for the fourth year required surgical subspecialty rotation. Although a great deal of time will be spent in the operating room, students will also be expected to attend outpatient clinics and work with different attendings seeing pre and post-operative patients. A designated student mentor is assigned for each surgery service. Students will meet with their current service mentor weekly to review history and physical notes taken by the student. Additionally, each student will meet with the Clerkship Director periodically to assess progress. Throughout the rotation, emphasis is placed upon developing skills needed by primary care physicians in surgical diagnoses and appropriate referral. Required lectures are scheduled from 7-8am and 3-6pm throughout the week and scheduled surgical conferences (M & M, Grand Rounds, and Professorial Rounds) are on Tuesday and Thursday mornings. Students are required to attend the regular surgery conferences. All general course objectives directly reflect those of UTHSC for the Surgical Core Clerkship, however specific lecture objectives may vary slightly. Preparing the student for both the NBME Surgery Shelf Exam and the on site Oral Exams are both goals of the clerkship. Students will take call every fourth night with the call ending at 11:00 p.m. Meal tickets will be provided to students on their call nights. Each student will also work one weekend within the eight week period. Remaining weekends are available for study, rest, and recreation time. Each student will receive a mid-term evaluation from the Clerkship Director where student strengths and weaknesses will be discussed. Final evaluations will be completed on the standardized UTHSC form by both Attendings and residents who have worked directly with the student. Students have full access to our Medical Simulation Center where opportunities are provided to increase surgical skills. New laparoscopic trainers offer students the ability to practice a variety of skills, such as suturing, dissection and pattern cutting, and allow the students to improve their visual, tactile and coordination skills. These training procedures range from the basics, such as drawing blood to more sophisticated procedures, such as endovascular surgery and trauma care. Sim Man, a full-sized patient simulator, offers training using pre-programmed scenarios, instructor-created scenarios, and on the fly training. Simulation equipment and models include: adult and newborn human patient models, endovascular simulator, procedural models, and laproscopic surgery trainers and instruments. Since the number of students on the surgery rotation is small, students have the opportunity to receive individualized attention from the staff. Faculty members are passionate about the field of surgery, well known throughout the country for their expertise, and dedicated to teaching. Opportunities to continue to receive the benefit of the faculty teaching skills are available through the surgical residency program. 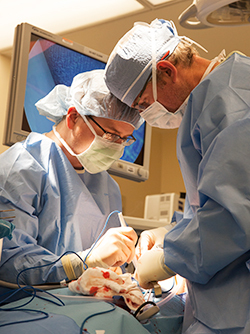 Surgical Education at the University of Tennessee Graduate School of Medicine, Knoxville is designed to exceed the special requirements for residency training in general surgery and produce surgeons with sound clinical and technical skills. Our residency is a five-year program that is fully accredited by the ACGME. We offer four categorical positions per year and preliminary positions. The program graduates have been highly successful in securing post-graduate fellowships, clinical practice positions, and pursuing careers in academic surgery. Visit the Department of Surgery for information about our residency program, faculty, and research. This clerkship offers the students an advanced clinical role in patient care including pre-operative evaluation, operative treatment and post-operative care under the direct faculty supervision. It includes significant outpatient experience with one-on-one faculty involvement, evaluation of patients presenting with emergency conditions, and participation in advanced laparoscopic techniques. IV, EKG, and laboratory teams preclude the need for paramedical services by students, but students are expected to perform invasive monitoring and treatment procedures. Participation in resident conferences and rounds with house staff and faculty are expected. This clerkship will allow students to learn the diagnosis, evaluation, and medical management as well as surgical and endovascular treatment options for patients suffering from peripheral vascular diseases. They will develop the familiarity with the noninvasive vascular laboratory and participate in all aspects of patient care for patients on the vascular service assigned. Students will participate in both open surgical and endovascular treatment of patients on the vascular service. Under supervision of the attending surgeon and surgical resident, the student will also be involved in writing notes and orders, performing history and physical, instituting care, making diagnosis, evaluating problems, plan therapy and seeing consultations. There will be one formal vascular conference per week in addition to the conferences regularly held in the Department of Surgery. Clinical performance at the level of a PGY1 and responses to Socratic questioning form the basis for evaluation. All six core competencies are assessed through daily and call interactions with the faculty. The objectives of this senior clerkship are for the student to learn how to evaluate and treat the acutely injured patient. Each student will manage patients during resuscitation and evaluation phase. They follow patients and coordinate care through initial treatment to their rehabilitation from acute injury. The students will be expected to assume primary control of a limited number of patients and will be responsible for working with their resident and faculty advisors to come up with appropriate treatment and plans. Students are also expected to see these patients during outpatient visits in the Trauma Clinic. Students must attend all conferences regularly held in the Division of Trauma/Department of Surgery and actively participate in discussion and lectures. Students are expected to take night call, but may set their own schedules for this. The student will learn how to manage the critically ill and injured surgical patient (both pre and post-operatively). In addition, they will learn how to use invasive hemodynamic monitoring and manage other support systems, such as ventilators, while dealing with multisystem failure and interacting with families of critically ill patients. The students will be expected to assume primary control of 1 or 2 critically ill patients during their shifts. They will perform admission history and physicals, write daily notes and orders, interact with the primary service and consulting services to help make diagnoses, evaluate problems and plan therapy. They will also see that the therapeutic plan is carried out. All of this will be done under the direction of residents who are assigned to the Critical Care Service, the Critical Care Fellow, and the attending physicians of both the Critical Care Service and the primary service. Students will be closely supervised by residents who are assigned to the Critical Care Service 24 hours a day, as well as the Critical Care Fellow and Faculty who are available 24 hours a day. They will also be supervised by the residents and faculty of the patient's primary service. Rounds with the attendings and residents are conducted at least twice daily. Critical Care Conferences to discuss management of critical care problems are conducted 2-3 times per week. In addition, there are daily Critical Care Service rounds, as well as the other conferences of the Department of Surgery, which include grand rounds, M & M conference, and x-ray conferences. Broad exposure to the diagnosis, evaluation, and multimodal treatment approach to a variety of cancers Intensive exposure to both the outpatient and inpatient management of patients with malignant disease. Outpatient: responsible for performing history and physical examinations on patients with newly diagnosed malignancies; analyzing treatment options for both new and returning patients. Inpatient: daily rounds under the supervision of the resident and attending staff, write progress notes, and assist in surgical procedures. Attend the weekly conferences of the Department of Surgery, and participate in the weekly Multidisciplinary Tumor and Breast Disease Diagnosis and Management Conferences. Weekly didactic session with a faculty proctor to guide the student's literature review of a particular topic in surgical oncology. Students' presentation of the review topic to the members of the surgical oncology division. One or two days may be spent with a faculty proctor in Radiation Therapy or Medical Oncology to allow the student an opportunity to understand more fully the concept of multidisciplinary cancer care from each disciplines perspective. Objectives of Clerkship: Improved understanding of cancer biology, surgical treatment approaches to both primary and recurrent cancer. Improved understanding of the integration of other treatment modalities in the overall management of malignant diseases. The students will learn the fundamentals of Advanced Surgical Technologies, optics, energy sources and staplers. The students will learn the basics of Laparoscopic physiology and anatomy. They will gain exposure to Laparoscopic simulator and dry lab skills experience. The students will see 3 to 10 patients per week. The students will work with residents and faculty to care for patients. They will make daily rounds, attend operative cases and evaluate patients in the clinic for pre- and post-operative care. Students are expected to work as an integral surgical team member during the rotation. Students will receive a high level of supervision from residents, faculty on the wards, in the OR, and in the clinic. Students will have a weekly lecture given by the participating (4 total lectures) faculty. Subjects will focus on advanced laparoscopic techniques, anatomy and physiology. This rotation/elective is a "patient care" elective. Additionally students will be given access Laparoscopic Laboratory facilities and will be provided with faculty teaching to learn basic Laparoscopic operative skills. Call will not be required for participation in this rotation. Students who complete this rotation have expanded their knowledge of the musculoskeletal system and the central and peripheral nervous systems. Students will develop a beginning level of competence in management of patients with disability through exposure to an academic rehabilitation practice. This will include rehabilitative history, examination, and exposure to rehabilitation in several settings. Students will develop skills in management of complex wounds. The students will have some responsibility for about 4-6 patients per week. By the latter part of the rotation, students will examine patients, take a rehabilitative history, and work with the attending physiatrist to develop a rehabilitative plan. They will be able to follow their patients through therapy in the inpatient setting. Students will monitor their patients and directly report to the attending physician. Students will work closely with the attending faculty. 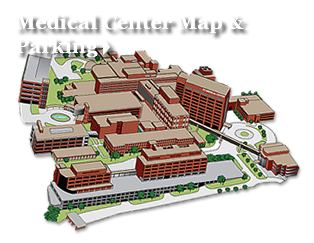 The settings are University Hospital for Consultations, the outpatient UT Wound Center, an acute Inpatient Rehabilitation Center, and a Skilled Nursing Facility with a Rehabilitation unit. 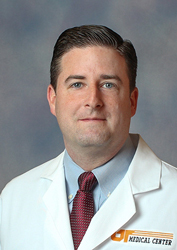 The attending physiatrist is a member of the Surgery department and attends Surgery Grand Rounds on Thursdays. The students will not be on call during this rotation. Students will have weekends free to study and enjoy the Knoxville area. Interested students are asked to contact Dr. Hecht at least a week in advance by text or call to 865-209-6089 to make arrangements regarding where to meet and what to read. The student will serve under the preceptorship of the faculty at The University of Tennessee Medical Center and will become familiar with cranial and spinal trauma, tumors, congenital malformations, vascular disease, and benign spinal disease. The student will scrub and assist the staff with operative procedures, participate in peri-operative care, and will become familiar with neuroanatomical basis of diagnosis and treatment. Serving the tenure on orthopedics, the student will attend several weekly orthopedic conferences of varying types as well as attend the general orthopedics and fracture clinics.. Rotation in the office of an attending staff with participation in patient care will be required during the clerkship. The student will be given the opportunity to develop diagnostic skills and participate in active treatment of patients, including case application, manipulation of simple fractures, attending surgery and helping with post-op cases. The students will become familiar with the care and management of kidney transplant recipient, living kidney donors and patients with end stage renal disease in need of dialysis access. The students will have responsibility for 3 to 6 patients per week. The students will be expected to function as a junior intern in care and management of transplant patients to facilitate flow of patients in the hospital and clinic as well as participate in surgical procedures at a level commiserate with skill and experience. The students will receive direct supervision by attending surgeon and PGY2 resident. The student will attend selection committee to discuss donor and recipient candidates, morbidity and mortality conference, general surgery grand rounds, and optional participation in GI tumor service. For non-patient care the typical procedure and activities the students will perform will be kidney transplant and vascular access. No in-house, overnight call. One weekend day rounds every other week. The Plastic Surgery Elective rotation is open to any 4th year student who is interested in pursuing a career in this specialty, or who would like to polish their surgical skills in preparation for a residency in another area. The student will be exposed to a wide variety of problems including facial trauma, head and neck reconstruction, breast surgery of all types, extremity trauma and body contouring procedures. We expect the student to function at a high level, and perform the duties of a 1st year resident. There will be close and intense supervision, and the student will work with our entire full-time faculty. This will be an energetic, stimulating, fun and educational surgical experience. The student will be an integral part of the Pediatric Surgical Team and will learn to evaluate and manage pre- and post-operative pediatric surgical patients including neonates and multisystem trauma victims, and will assist in their operative care. 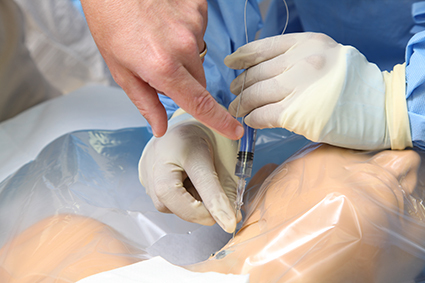 Related opportunities to learn the essentials of pediatric enteral and parenteral nutritional support, invasive and non-invasive monitoring procedures and techniques, respiratory support techniques, and a variety of pediatric vascular access procedures will be available. The student will learn to refine communication skills in dealing with patients' families and the children themselves. Students will be on call every fourth night. Patients will be assigned to the student and he/she will be responsible for daily assessment, progress notes, and execution of the therapeutic plan. Direct supervision will be provided by the Pediatric Surgery Resident and Faculty, each of who is accessible 24 hours a day. Rounds with residents or faculty will be held at least twice daily, and informal conferences will be held at least twice a week. One such conference during the rotation will be the responsibility of each student, where a researched, bibliographed and outlined presentation on a topic of his/her choice will be presented to the other members of the service. The student will act as an Intern on this service and be exposed to all aspects of a University based Urology Service. The student will be responsible with one house staff member for approximately 25-30 patients and will assist in surgery. The student should obtain good 'hands on' diagnostic urological skills and be given duties commensurate with demonstrated ability, knowledge and skills. The student will attend Surgery Grand Rounds, and the weekly M & M and Cancer Meeting Conferences. In addition, the student will participate in the monthly GU Radiology Conference.